Cut for speed. The extremely aerodynamic Sleek 99 jersey sets new standards in aero design for a road jersey. It’s made with the same cut as the famous Maglia Rosa, with the front, sides and back pockets made from Rudy fabric, which guarantees extreme breathability. The sleeves and back are in Bodyfit, which is extremely light and strong, at just 90g per square meter. The cut of the collar is inspired by Santini's aero speedsuit designs similar to the one used by Peter Sagan in his UCI Road World Championship victory for Team Slovakia. The petal form alleviates any discomfort that may be caused by the zipper coming into contact with the neck. An elastic silicone grip at the bottom maintains the jersey in the correct position. Inspired By Italy’S Gran Tour The Cut Is Derived From The Giro D’Italia “Maglia Rosa” Leader Jersey. Ultralight Construction Complete Jersey Weighs Just 120 Gr*. 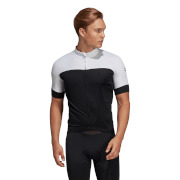 The Santini Sleek 99 Jersey hugs the body without being restrictive. Very very comfortable to wear. Very good looking. So nice that I decided to order the matching shorts. The seams on the arms lay flat. It feels almost like you're wearing nothing at all and yet the pockets are very deep and secure. 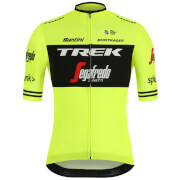 Another great product from Santini and PBK.